Weight bias dies hard. One step forward and you can be sure a step or two back will follow. Such is the case as the media obsesses about the weight of candidates for president. 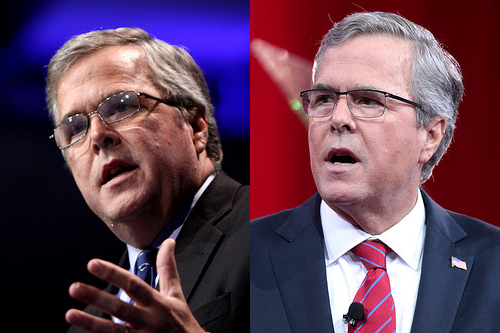 Jeb Bush in particular was singled out this week for dieting to be president. He’s lost an estimated 30 pounds on the Paleo diet since late last year. The New York Times frets that his diet “runs the risk of putting him at a dietary distance from the American electorate.” Jonathan Chait proclaims in New York Magazine that “Jeb Bush is going to get fat again.” Forbes contributor John McQuaid says he “should stop starving himself.” Reuters sought out expert opinions on the faddishness of his diet. Is it too much to hope that they will give it a rest? Candidates seem resigned to being judged by their weight. Before Mike Huckabee ran in 2008, he lost 110 pounds and even wrote a book about it. Chris Christie had bariatric surgery. Like Bush, Hillary Clinton is reportedly following a Paleo diet, but reporters seem to be a bit more careful with body image comments about her. BMI is far from a perfect measure of health. For measuring character and leadership, it’s useless. Let’s let it go. Click here to read more in the New York Times and here to read more from Reuters.